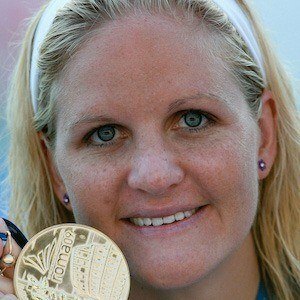 Olympic swimmer who won three medals, including one gold, at the 2004 Summer games, and four more in Beijing in 2008. She studied at Auburn University, where she helped lead the Tigers to the NCAA Championships in consecutive years, while earning three individual titles. After her 2008 Olympics performance she was hailed as one of Zimbabwe's greatest heroes, and called a national treasure by the head of the country's Olympic commission. She was born in Harare, Zimbabwe. The president of the country, Robert Mugabe awarded her $100,000 cash for her Olympic medal wins, and called her a "golden girl."